A large bowl of roast potatoes is a good addition to a buffet table, even if everything else is cold. We have potatoes in the garden at the moment, so as I like to use what I have available I’ve been cooking a few of these versatile tubers lately. I came across this recipe on taste.com and it’s a real winner. There’s no need to par-boil the potatoes or even peel them, so the preparation time is less than 10 minutes. 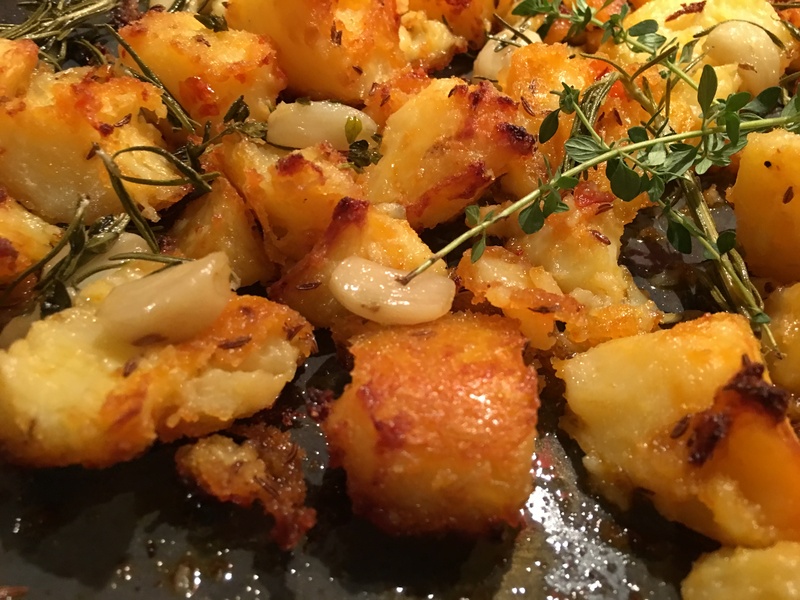 The original recipe calls for kipfler potatoes, but just use whatever you have. If you’re buying the potatoes get ones which say they’re good for baking/roasting. Preheat oven to 180°C. There’s no need to peel the potatoes unless you prefer to do so. Just scrub them and cut them into even-sized pieces – about 3cm square – and place in a large bowl with remaining ingredients. Mix well then spread out in one layer on a shallow baking tray. Bake for about 50 mins, turning twice, or until crispy, golden and cooked through. Tip into serving bowl and garnish with sprigs of fresh rosemary. On the menu of a restaurant in Geneva where we once ate Steak Tartare was translated as Raw Meat. Doesn’t quite have the same ring, does it? SBS Television’s French Food Safari with Maeve O’Meara and chef Guillaume Brahimi recently featured his Steak Tartare served with Pommes Gaufrettes. Now when it comes to kitchen gadgets I have to confess that I’m pretty well stocked, but I didn’t have the special mandoline cutter you need to make these lacey potato chips. So of course I simply had to get one. The Børner Wave Waffle Cutter from Germany cost just $20 including postage when I ordered it online. I couldn’t wait for it to arrive. 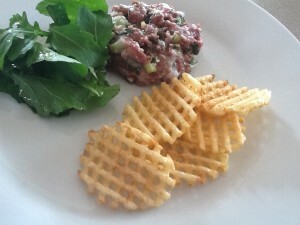 Matthew is very fond of Steak Tartare and I don’t mind it once in a while, so I decided to try my new gadget last weekend. Guillaume’s Tartare recipe includes tomato ketchup, but I prefer to use olive oil and lemon juice as I think ketchup can be a bit overpowering. The photo makes it looks a bit like an uncooked burger. But when all’s said and done, that’s what it is – raw meat! Slice potatoes with a waffle cutter or an ordinary mandoline and place in cold water to remove starch. Drain and pat dry with paper towels. Heat oil and fry potatoes in batches, until crisp and golden, then drain on paper towels. The oil needs to be very hot so they cook quickly. Test with one first. Very finely dice the beef by hand. Mix all ingredients for Tartare. Season with salt, pepper and lemon juice to taste. Form into quenelle shapes with two spoons, or use a stacking ring or biscuit cutter to form into a neat round shape on 4 serving plates. Garnish with Pommes Gaufrettes and a small green salad. Meat should be very fresh but it doesn’t have to be fillet. So long as it’s lean and very finely diced with a very sharp knife you can use topside or round steak. You don’t need a deep fat fryer to cook the potatoes. I used about 2cm of oil in a medium sized frying pan and cooked them in two batches. If preferred serve the Tartare with garlicky bread croutons made from a French loaf. A family birthday is a good excuse to cook up a storm and open a few bottles of good wine. Last weekend was one such occasion, so I worked out a menu which included some of the birthday boy’s favourite foods. Instead of a starter I made 4 different finger foods from Drinks and Nibbles, a Marie Claire book by Michele Cranston, served with Chile’s delicious national cocktail Pisco Sour, which we’re all rather partial to after a four year posting to Santiago. The grilled prawns were definitely the hot favourite, followed by the seared tuna, then the ceviche and lastly the watermelon and feta squares. But they were all good. For the main we had rack of lamb with herb and caper crust, served with thyme infused carrots and minted peas – all recipes from this month’s Delicious magazine. Individual potato soufflés, inspired by a meal we enjoyed at the Artisan restaurant recently, completed the plate. I had to invent the recipe, but they turned out well. As you can see in the photo, the plating of the main course left something to be desired – a result of too many cooks in the kitchen, all trying to get the various ingredients onto the plates and onto the table before they went cold! D’Argenberg’s Footbolt Shiraz was a good choice to go with the lamb. For dessert we had a tasting plate of three small desserts – all faves of the birthday boy – chocolate ganache with pink peppercorns, white chocolate mousse with raspberry coulis and a salted caramel tartlet. Here are the recipes, tweaked and adjusted a bit as usual. I have changed the cooking method for the carrots, because they ended up more or less steamed rather than glazed as I would have liked them. This method will achieve that. 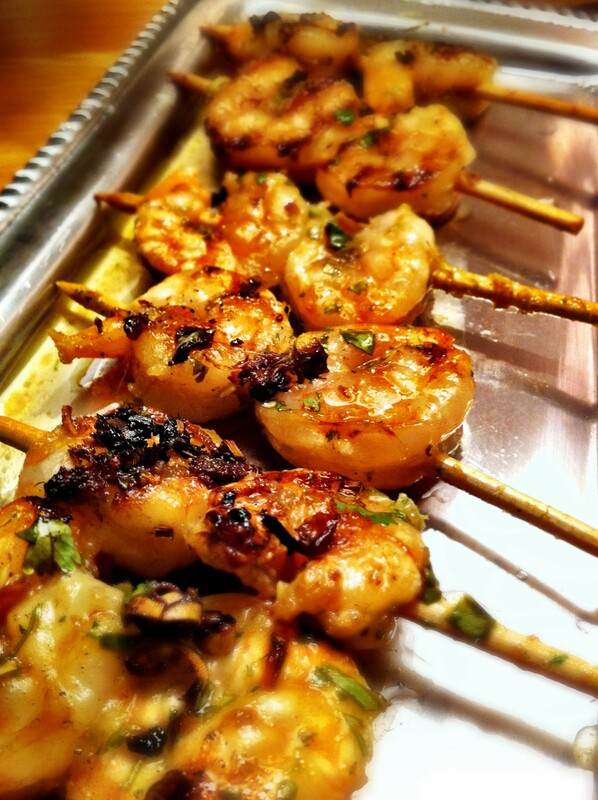 Thread prawns onto skewers – using one prawn per skewer if large and two if smaller, then place in one layer in a shallow dish. Place coriander root, ginger, garlic, lemongrass, vegetable oil and ground coriander in food processor and blend to a paste, then pour over the prawns, turning them to coat. Leave to marinate, covered, in the refrigerator for at least an hour. Place chopped coriander leaves, lime juice, olive oil, sugar and salt in a jar with a lid. Shake to combine then put aside. Grill prawns on a moderately hot BBQ or grill for 2-3 minutes each side. Place on serving dish and drizzle with the coriander dressing. Place tamarind water, palm sugar, lime juice, ginger, fish sauce, sesame oil, chilli, kaffir lime leaves and lemongrass in a jar with a lid. Shake then put aside. Peel and slice cucumbers and cut into 1cm rounds. Heat a lightly greased frying pan over high heat and sear the tuna fillets for 1 minute each side. Remove from heat, season with a little salt, then cut into pieces about the same size as the cucumber rounds. Add coriander and peanuts to the dressing in the jar, shake then spoon some onto each square of tuna, then place onto a cucumber round and arrange on serving tray. 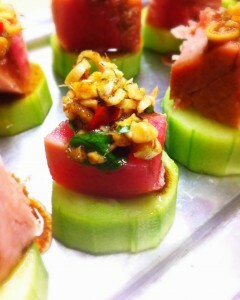 If you put the tuna on the cucumber first, then the dressing, it tends to go everywhere. Cut fish into bite-sized cubes and place in a glass or ceramic dish. Cover with lime juice and refrigerate 2 hours. Mix coconut cream, ginger, turmeric, sugar, coriander root and salt. Drain fish, discarding lime juice and mix into coconut dressing. 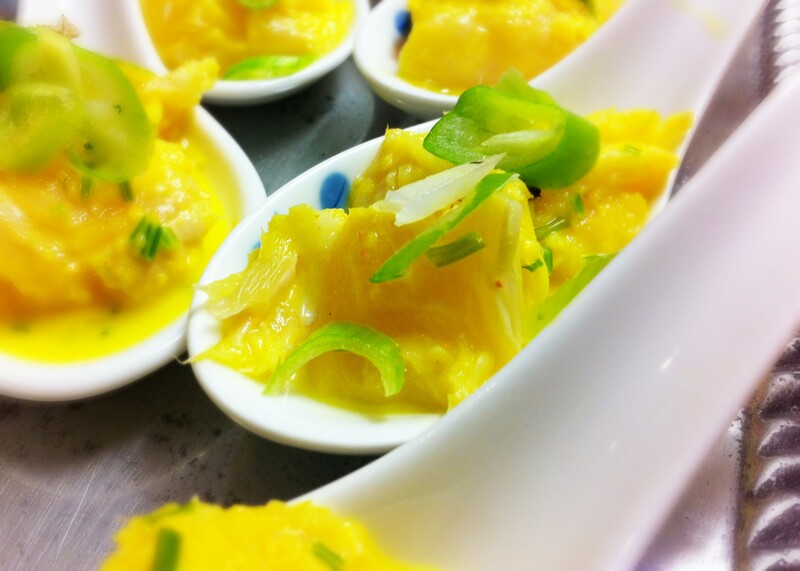 To serve, place a cube of fish onto each Chinese spoon and garnish with the spring onion. Cut watermelon into bite-sized cubes. The recipe said 3cm but this was a bit too big to eat in one mouthful – 2cm cubes are a better size. Cut feta into 1cm cubes. Mix sumac, olives, olive oil, parsley and thyme. 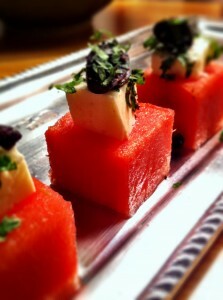 Place a small amount on a feta cube, then place the feta cube on a watermelon cube and arrange on serving plate. Repeat with the rest of the cubes and serve immediately. Place pisco, ice and sugar in blender and blend for 2 minutes. Add lemon juice, mix for 2 minutes, then add egg white and continue to mix until sugar has completely dissolved. Pour into 6-8 cocktail or champagne glasses and if liked place a few drops of Angostura bitters on top of each. Serve immediately. Preheat oven to 200°C. Roast lamb for 35 minutes for medium-rare (see note below) or until cooked to liking. Rest for 10 mins then carve into individual cutlets and serve with the roasted shallots and rhubarb compote. Note: the Delicious magazine recipe calls for spring lamb. 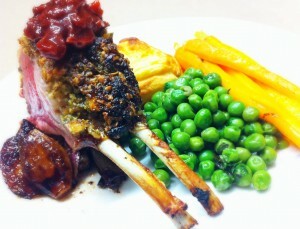 The lamb racks I used were larger and had 9 cutlets each. I had also done the browning earlier in the day, so they had got cold. So I roasted them for 45 mins, plus resting time and they were perfectly cooked, medium-rare. If the crust starts to get too brown during cooking time, cover loosely with a piece of foil. Scrub carrots and trim, leaving a short bit of green at the ends, then halve lengthwise. Cook in boiling salted water until just slightly under-cooked. Refresh under cold water, drain then put in a frying pan which is wide enough to fit the carrots. Add remaining ingredients then put the pan aside until close to serving time. Bring to the boil then simmer, turning the carrots until they’re nicely glazed and the liquid has evaporated. Serve immediately. Cook peas in boiling salted water for 2-3 mins. Refresh under cold water, then drain. Place in a saucepan with remaining ingredients. Can be prepared ahead to this stage. At serving time reheat over medium heat, stirring. Season to taste and serve immediately. Set oven to 180°C and oil about 10 half cup soufflé dishes and place them on a baking tray. Preheat oven to 200°C. In a non-stick saucepan heat butter and when melted add flour. Stir for 2-3 minutes until the flour is cooked but not coloured, then gradually add the milk, mixing to incorporate before you add more. When sauce is thick and smooth add nutmeg, mashed potato and season to taste. Remove pan from heat and add the egg yolks one by one, placing the whites in a large mixing bowl. Beat the whites until soft peaks form, using electric beaters. Add some of the sauce to the whites and mix well, then add the rest and mix thoroughly using a plastic spatula. Divide mixture between the soufflé dishes, filling them almost to the top. Bake for about 15 minutes or until risen and golden brown. If liked you can serve them now, leaving them in the dishes and just sitting them on the side of the dinner plates. Or you can use the following twice-baked method which takes a bit of the stress out of the last-minute nature of soufflés. Remove from the oven and leave to cool. Line a baking tin with baking paper and spray it with oil, run a knife around each soufflé and tip onto the paper, leaving a space of 2-3cm between each one. 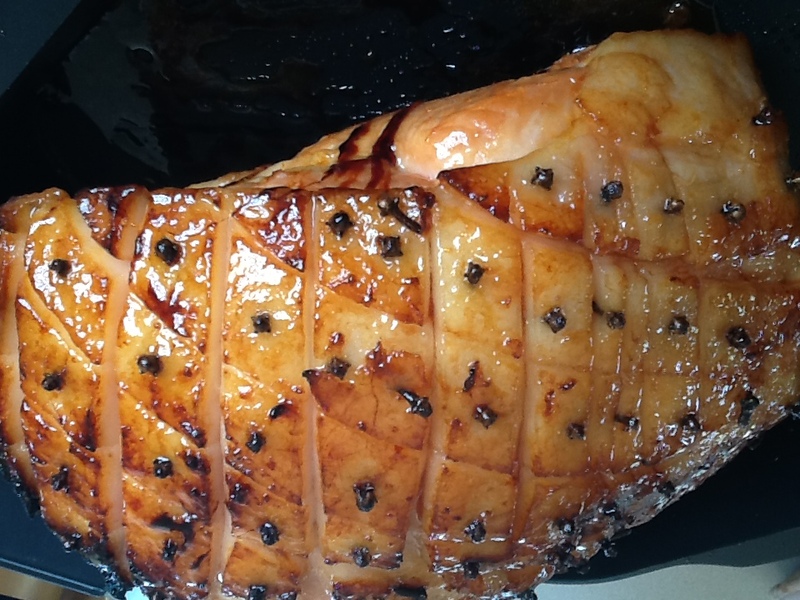 Recipe can be made ahead to this point and kept refrigerated and covered, for up to 24 hours. To serve set oven to 200°C. Using a pastry brush, paint the top of each soufflé with a little beaten egg, then bake for 10-15 minutes, or until puffed and golden. If serving with the rack of lamb, place in the oven during the last 10 mins of the lamb’s cooking time, then they can continue to cook when lamb is removed to rest for 10 mins. Soufflés will take slightly longer if they’ve been in the fridge. Remove with a fish slice to serving plates. Chocolate Ganache: heat cream to boiling point. Add chocolate broken into squares and stir until melted. Divide between about 8 shot glasses (will depend on size) then chill or you may prefer them at room temp. Serve sprinkled with a few pink peppercorns. White Chocolate Mousse with Raspberry Coulis: place chocolate, milk and vanilla in a bowl over simmering water until chocolate has melted, stir well and remove from heat. Dissolve gelatine in a Tbs of water, zap in the microwave then mix into the chocolate. Cool a bit then mix in the egg yolks. Whip the egg whites first then using the same beaters whip the cream (not the other way round as the whites won’t whip with greasy beaters!). Fold the cream into the chocolate, then lastly the egg whites. 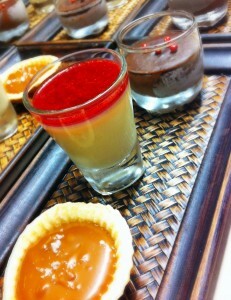 Pour into about 8 shot glasses (will depend on size) leaving a small space at the top for the coulis. Refrigerate several hours or overnight. Coulis: defrost the raspberries and mix with the sugar. Leave for a while so the sugar dissolves, whiz in a blender, then push through a sieve, discarding the seeds. To serve, pour a layer of coulis on top of each chocolate moussse. Salted Caramel Tartlets: in a small saucepan heat cream and caramel Top ‘n Fill gently until thoroughly incorporated. Cool slightly then use to fill tart shells. Store at room temperature for up to several hours. Serve sprinkled with a few salt flakes. This is enough filling for about 20 tartlets. Arrange the three desserts on a small plate or individual serving tray (as shown in photo). Some neighbours have sold their house and are moving, so we invited them round for a farewell BBQ dinner. 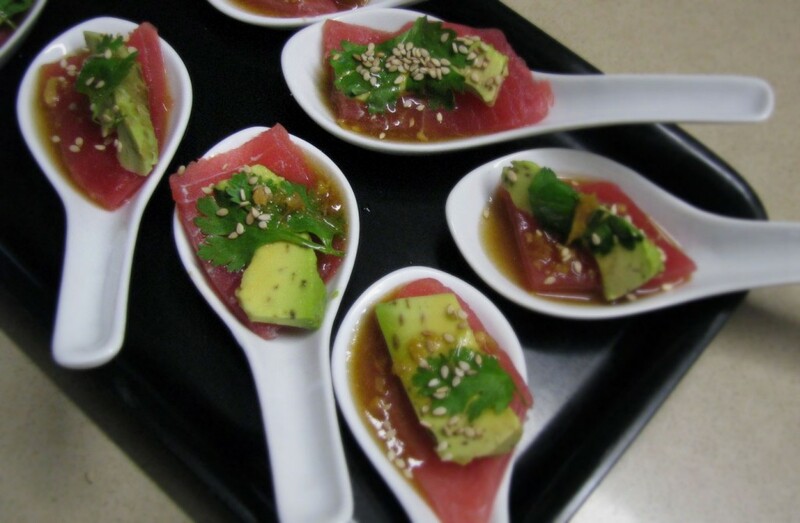 With drinks I served Tuna and Avocado Spoons, drizzled with a Wasabi dressing. Invented by my daughter Catherine, these delicious mouthfuls make the most of sashimi grade tuna and are made in a jiffy. For the main course we barbecued some Chicken and Chorizo kebabs and served them with Crispy Potatoes with Bacon and Rosemary (Delicious magazine February 2012) and Shaved Fennel and Zucchini Salad topped with crumbled feta – another winner from Catherine. For dessert a crustless Lemon Tart with cream. The weather has suddenly turned wintry so we had to eat inside. A week ago we were able to sit outside until eleven when some other friends joined us for dinner. It’s been a very strange summer weather-wise. Slice tuna thinly. This is easier to do if the tuna has been frozen and is only partially thawed. Arrange a piece on Chinese spoons, top each with a slice of avocado and a coriander leaf. Drizzle with dressing, sprinkle with sesame seeds and serve when the tuna has thawed – it will only take a few minutes. Dressing: Place all ingredients in a jar with a lid and shake vigorously. Soak about 16 wooden skewers in cold water for 20 mins or so. Place marinade ingredients in a large bowl and stir to combine. Trim chicken to remove any fat or gristle and cut into 2.5cm cubes and add to marinade. Stir to combine – chicken will pretty much absorb it. Cut the sausages into 1cm slices. Thread chicken and chorizo onto skewers, alternating them. Leave aside in a dish to continue marinating. Can be made ahead and kept covered in the fridge for several hours or overnight. Cook on a medium-hot barbecue for 8-10 minutes each side or until cooked through. The quickest way to cut the zucchini (courgettes) and fennel is through the slicing blade of a Magimix or using a mandoline. Place in a bowl with dill and rocket. Place dressing ingredients in a jar with a lid and shake vigorously. Mix dressing with salad then pile into a shallow flattish serving dish. Sprinkle the pine nuts and crumbled feta over the top. If liked peel the potatoes or just scrub them well and cut into cubes. Line a roasting pan with baking paper and set the oven to 180°C. 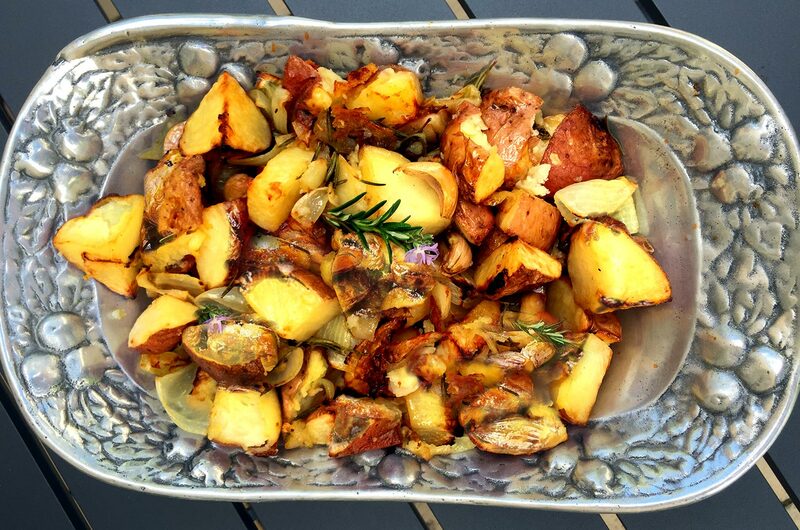 Mix potatoes with 1/4 cup olive oil, rosemary leaves, salt and pepper to taste. Tip into the roasting pan and roast for about 40 minutes, or until golden, stirring once or twice during cooking time.. Meanwhile heat 1 Tbs olive oil in a frying pan and cook bacon for 2 minutes, stirring, then add onion and garlic and continue to cook for 8-10 minutes until soft. Add onion and bacon to the potatoes, mix through then continue to bake for a further 10 mins. Mix in the parsely and serve. Preheat oven to 170°C. Lightly butter a ceramic quiche or similar round dish and line the bottom with baking paper. With electric beaters, beat the egg whites until they hold soft peaks. In another bowl with the same beaters, beat butter and sugar until light and fluffy, then beat in the egg yolks, cream and lemon juice and rind. Fold in the sifted flour and lastly the egg whites, in two batches. Tip into the dish and bake for about 25-35 minutes or until set to the touch and golden. Turn off the oven, open the door and leave the tart to cool in the oven. When cool, refrigerate until serving time. Dust with icing sugar and serve with thick cream.